I bought a cute baby goat, now what? Whether you are purchasing kids that will be pets, pack goats, brush eating wethers, milkers, show does, or filler for your freezer, good early care is instrumental in how healthy they will be for their entire life. In the goat world you will hear possibly hundreds of different opinions on how to do things the 'right way'. We don't claim that our way of raising kids is the best for everyone, we just want to share our procedure of raising kids with our customers. Our method is based on research, the advice of two wonderful veterinarians (one that also owned goats and one that likes and understands goats), our experience, and the advice of goat breeders with many more years of experience than we have yet acquired. The first thing to know about goats is that one is a really lonely number! Unless you will be sending all of your time hanging out with your goat, please try to get at least two. Goats are herd animals, and need companionship. They will occasionally bond to another animal, such as a sheep, horse, or livestock guardian dog, but lots of thought needs to be taken when considering that as an option. A grown goat may make a fine companion animal for a lonely horse, but it is pretty obvious when you think about it that a young 10 lb goat kid is not safe left alone with a 1,000 lb horse! Carefully consider what you need a goat to do for you- if you have several acres of brush that you need trimmed, a goat kid isn't going to take care of that until they are at least a few months old. If you have a field of grass you need kept trimmed, you may want to remember that goats are browsers, not grazers- you may be happier with the results you gain from sheep. 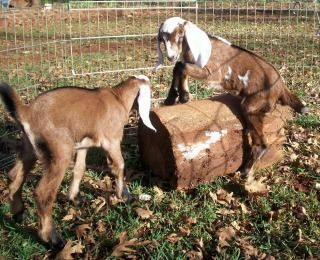 If you need a companion for a large, grown animal, consider getting a more mature goat, not a kid. Of course the perfect food for baby goats is goat milk, but unless you already own your own milk goats, that is probably not what you will be feeding your goat kids. We recommend using whole cow's milk from the grocery store, a quality goat milk replacer, or a 50/50 mix of goat or whole milk and goat or cow milk replacer*. We free feed our kids cold milk in lambar buckets. Free feeding warm milk can encourage overeating, and may lead to bloating and dead kids; they don't overeat cold milk. If bottle feeding, then offer each kid 20-24 ounces of milk at each feeding. Starting at about a week old we start offering free feed alfalfa to the kids. They start nibbling early and as they eat less milk we increase the hay. The protein and calcium in the alfalfa is important for the growth of kids, and should be the main part of their diet. If we add grain to our kids feed routine, we do so a few weeks before they are weaned, so they don't have too many dietary changes at one time. * Note on feeding- we have never had a problem switching babies from straight goat milk to straight cow milk, but if switching to 50% or 100% milk replacer, please do so slowly! Change to the new milk product 1/4 of feeding amount at a time over a few of days to reduce the chance of scours in the kids. Goats need a well ventilated but draft free shelter with a floor that is easy to clean and that drains/dries well. Luckily they are not a huge animal, so they can have shelter that is very creative and reasonable to create. Four pallets, some plywood, and some good bolts can easily be fashioned into a three sided shelter large enough for two smaller adults or one large one. 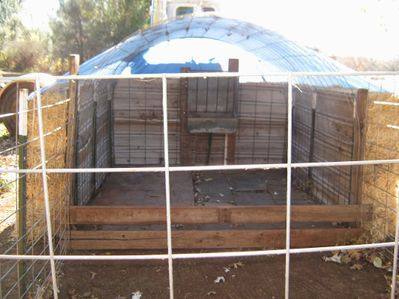 A super big dog house or dogloo may be perfect for goat kids while they are young. As they grow, temporary shelters can be easily constructed- the ones pictured here are made with 2 1/2 cattle panels, used roofing tin, rice straw bales, 10" spikes & 1/2" washers, good Costco tarps, and t-posts. Other than plenty of good food and a dry, draft-free shelter, the best thing you can do to grow healthy, happy goat kids is keep them on a parasite prevention program until they are at least 6 months old. Small numbers of worms and parasitic protozoa are present in a healthy adult goat's gut, but in growing kids you want to minimize parasite infection until they are well grown and can more easily handle the stress that parasites can cause. Simply put- coccidia and Haemonchus contortus can kill kids much faster than adult animals. We vaccinate our does before they are due to kid so optimize passive immunity in the kids. They receive a CD&T vaccine and one of their 3 yearly doses of BoSe (selenium & vitamin E) about a month before they are due. Kids receive BoSe at birth and every 4 months. We vaccinate them with CD&T at 8, 11, & 14 weeks old, then booster once a year. Beginning in 2018 we plan to start vaccinating all of our adult does and kids for pasteurella pneumonia. The kids will be vaccinated begining at 4 months of age.